My eager-to-learn six year old is already out of school for summer break. In the week and a half he has been out of school he has been reading a ton and National Geographic Kids series of readers are my favorite of all of his books and ones he is always eager to read. We bought a couple of the readers through the Scholastic book club and I was so impressed with the series I reached out to see if we could partner on a review of the readers line of books. My son loves the reader books and I really appreciate how informative they are teaching him while he’s reading through the book. His favorite parts of every book are the jokes, the interesting facts page and he LOVES the “Stump Your Parents” quiz at the back of the book. I always get quizzed and it’s the perfect way for him to hear the information again and help him remember the facts he just learned. Every page is full color and very vibrant with really interesting and unique pictures that grab your attention. The National Geographic Kids Readers come in three different levels to be appropriate for a range of reading levels. Each level increases in the amount of text, the vocabulary used, and it even feels like the subjects increase in difficult as well. The Almanac is geared towards children ages 8-12 but even my 6 year old loves looking through the book, checking out the activities, and reading the book, too. You’ll notice in the pictures, this Almanac is LOADED with interesting information that kids will be eager to learn about. It covers a huge variety of topics. The National Geographic Kids Almanac 2014 has a map section and lots of information on different countries and states. We are planning a road trip for this summer so I love the details included about the states so he can learn some fun and interesting things about where we will be headed and see just how far we are going by showing him on the map how far we drove in a day and relate the map to experience to build his awareness of the world around him. There are TONS of chances to win a NG Kids Almanac 2014! Visit the National Geographic Facebook page to see all the blogs hosting giveaways this week. The prizes are up for grabs for just this week so hurry over and enter! 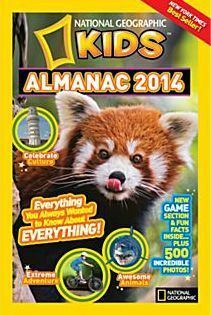 Win a National Geographic Kids Almanac 2014! I received a variety of National Geographic Kids readers and a Kids Almanac 2014 in exchange for this post. The opinions expressed above are my own. Any claims should be verified on the sponsor’s site. This book looks very interesting! I would love to win this for my son and daughter who both love animals. I think my grandson would love this book, there is so much information in it, I would love to share it with him. I loved National Geographic as a child and enjoy it with my family still. I know this is for “kids”, yet I found it an interesting read when I picked one up a couple of years ago! Our daughter likes these books. She has one that’s a bit out-of-date. would love to win this for my son! thanks! My daughters would love looking through this book. My grandsons would love the Almanac. Lots of great photos and information. This book has great photos. My six year old would love it. My kids love nat Geo! My kids would love these! Great interesting facts to read and learn. Incredible amazing pics in this magazine! This is such a wonderful book for kids and adults. I really would enjoy reading this with my grandchildren. We love to read together and National Geographic offers great stories/articles and beautiful pictures that the whole family could enjoy. This is a great book. I would like to wn the National Geographic Kid’s almanac for my daughter. My son, although young, would absolutely love these books! He’s obsessed with nature/science! My youngest is obsessed with Nat Geo books, to the point where she can recognize them just by the yellow square in the title. She collects them like crazy and would adore this! When I was growing up I loved the adult version of National Geographic I don’t think they had the kids version back then. my son would absolutely love this book!!! We love Nat Geo!!! THanks!! I love National Geographic. Cool stuff! This looks like a great book – full of information!! I would love this for my girls. They would love to learn about animals. My boys would love to look at these books. My son loves looking through my husband’s Nat Geo magazines. We love our National Geographic subscription. I would really, really love to get a NatGeo Kids subscription as well! My son loves learning new things so he would enjoy this! I love science and geography and maps, etc..Always have. I think I’m the most excited person at the school science fair each year! Thanks for the chance to win this great book. I think my grand-daughters would LOVE this. Like I did as a kid, they love facts, pictures, details. I hope I can win, this would be great to have at the camp for the kids!